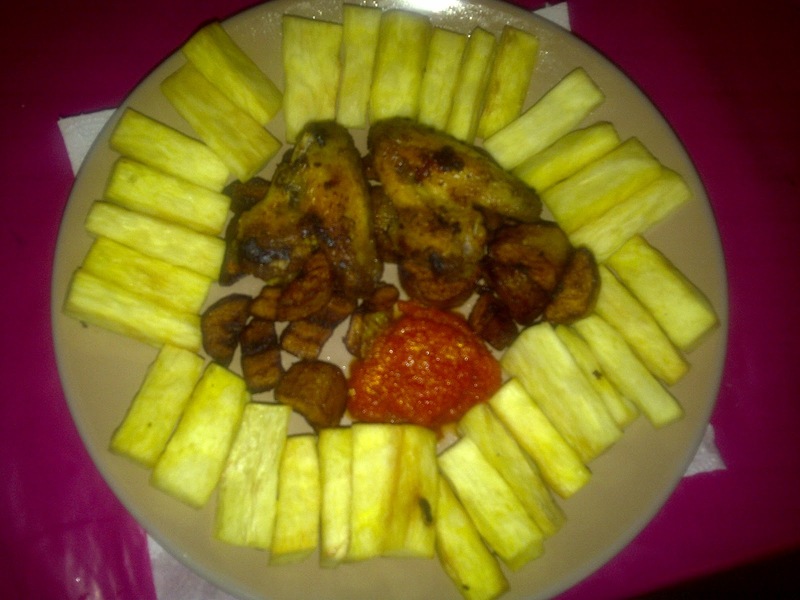 A piece of yam sliced into short rectangular pieces. You can cut up as many as will be enough for you. I always start with the chicken since it takes a while for it to cook. Since I usually buy my meat in bulk I often spice it when its fresh with ginger, garlic and some mixed spices and a little bit of salt before storing it in the freezer. This allows it to have much more flavour when cooked. However since most people do not practice this method, you can go ahead and spice the fresh chicken with the spices mentioned and then steam-fry it in a pan. I would recommend using no oil because the chicken contains enough fat to cook itself. Then regulate the cooker to medium temperature and cover the pan to allow the steam to cook the chicken until the oil secretes and it begins to fry. Put the sliced yam pieces in salty water and let it sit for about 15 minutes before pouring the water out. Fill a deep pan with oil leaving space at the top of the pan of at least 2 inches to serve as a safety margin when the oil bubbles up when the yam is added. Allow the oil to get very hot before adding the yams a few pieces at a time. 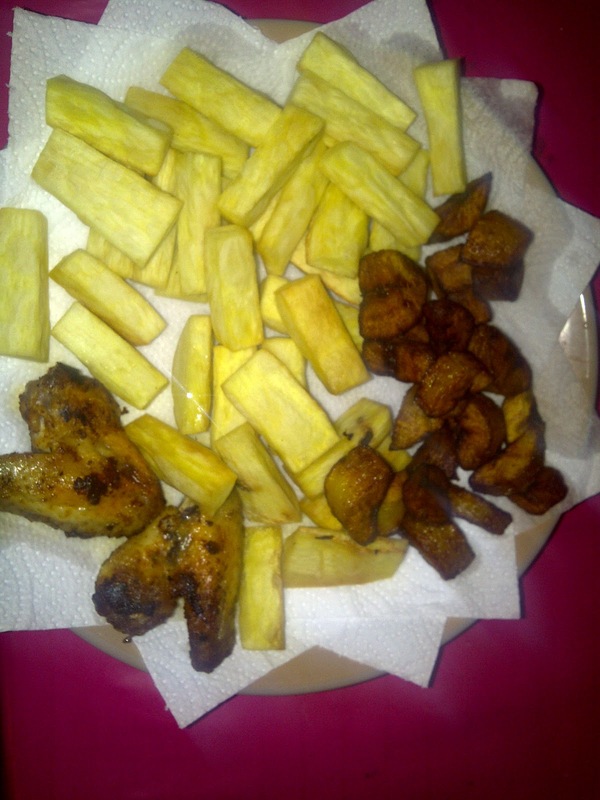 Avoid over crowding the pan so that the yams do not get saturated with oil. The yam is ready when the coating turns yellowish. You can turn the pieces over when needed to ensure that they cook evenly. To prepare the hot chilli sauce, chop up the tomatoes, onion and antilla peppers and put them in a blender. Blend till smooth and heat the table spoon of olive oil in a small pan. 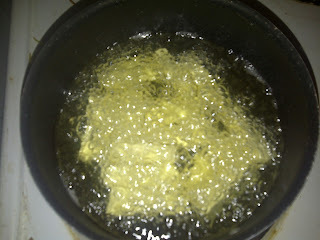 When the oil is hot add the blended mixture and allow it to fry for 10 minutes. Add a little bit of curry powder and salt to taste and stir. Allow to cook for 10 more minutes till its ready for serve. Now that everything is ready you can put them all in a plate and even add some artistic arrangement to make it look more palatable. 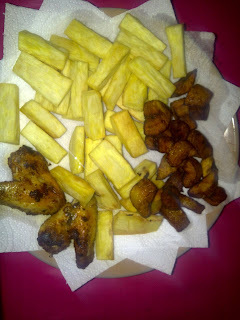 This is a very popular quick meal in Ghana and can be easily prepared by anyone.